Join our loyalty rewards program, B. Cos, and receive points for every dollar you spend. You could receive 10 B. Cos loyalty points for writing a review and/or rating this product. Shop and select pick up in-store to see if a product is available at your Cos Bar, then add to bag. Head to the check out page and make sure you select pick up in-store. Relax. We'll do the rest for you and let you know when your order is ready for pick up. See below for availability of your item in our stores. Please select your local Cos Bar in your bag and all available items will be ready for pickup in approximately 4 hours. 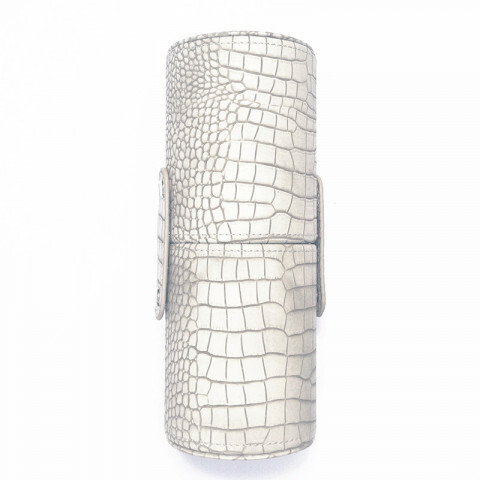 This chic mock-croc case is the ultimate marriage of form and function. Two hard sided cups snap together and apart to keep brushes protected, clean and accessible. This brush case is a classic luxury to hold my daily use brushes. Loved the design and the way it completely protects my brushes from outside wear and all other ways of contamination. Perfect accessory for travel as well. You don't need a different travel brush case when you have this. Just pick this up and throw in your bag. Glad, I got it! Login or create an account to earn B. Cos Loyalty points for sharing. Login or create an account to be rewarded for sharing your referral link! When your referral makes their first purchase, you'll get 200 B. Cos loyalty points. Enter your email address to sign up and receive 10% off your first purchase! exclusive promotions, new arrivals, and more! PLUS, receive updates on SPECIAL EVENTS and OFFERS at your nearest Cos Bar! Complimentary shipping for B. Cos members, no minimum required.